BAPCPA Man Shows that Bankruptcy Can Be Humorous! 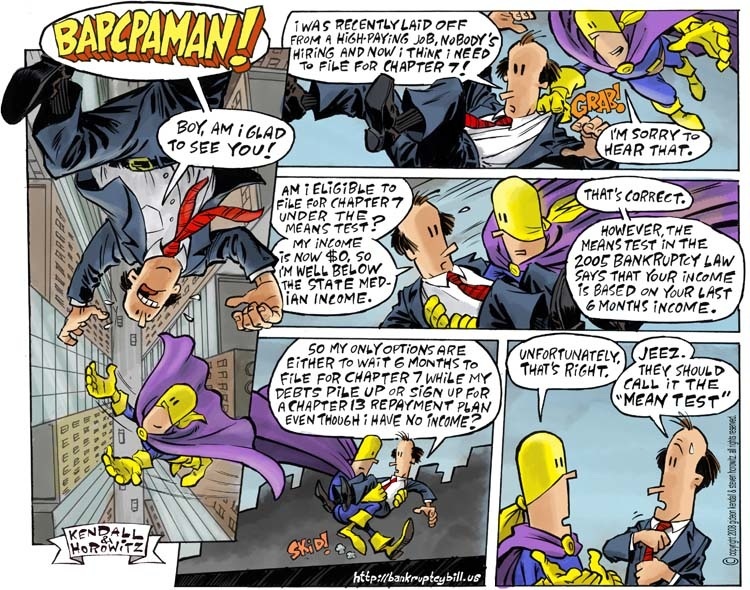 I am pleased to post the sixth cartoon strip of BAPCPA MAN , the new comic strip from New York bankruptcy attorney Steven Horowitz and and artist Gideon Kendall. Here is strip number six. BAPCPA MAN  is designed to entertain both consumers and bankruptcy attorneys. Steve and Gideon originally came up with the well-received Bankruptcy Bill  cartoon strips, about a hapless New York City bankruptcy attorney associate at a large bankruptcy firm. “BAPCPA”, an acronym universally known to all bankruptcy attorneys, stands for The Bankruptcy Abuse Prevention and Consumer Protection Act. This is the new bankruptcy law that went into effect in 2005. The strips seek to educate consumers, humor attorneys, and will also try to poke fun at some of the more ridiculous requirements of the new bankruptcy law. Please check out the Bankruptcy Bill and BAPCPA Man Website  which now has references and links to other bankruptcy blogs around the country. The strip is posted with permission from Bankruptcy Bill.